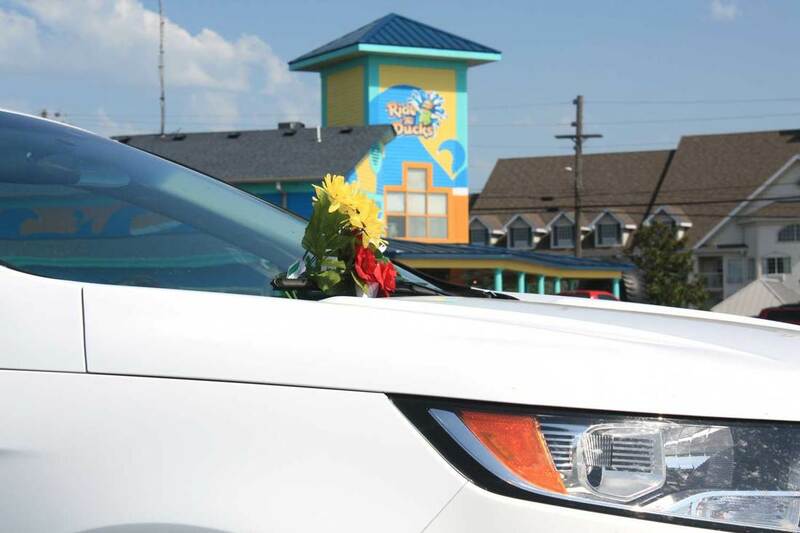 Members of the public have placed flowers on the vehicles left in the parking lot of the Ride the Ducks attraction. 17 people are dead after a Ride the Ducks tour boat sank on Table Rock Lake last night during a storm. Multiple agencies responded to the dock of the Showboat Branson Belle after 7 p.m. on Thursday, July 19, after calls that a Duck tour boat was sinking nearby. Stone County Sheriff Doug Rader confirmed at a press conference at the scene Friday morning that there were 31 people aboard the vehicle when it sank, including 29 passengers and 2 members of the crew. As of Friday morning, July 20, Rader confirmed that 17 people died and 14 survived from vessel sinking. Duck boats are vehicles that can operate on both land and in the water. At the time of the press briefing this morning, four bodies were still missing and Missouri State Highway Patrol dive teams were conducting their search. At 10:30 a.m., the Sheriff’s Office Facebook page was updated, stating the missing bodies were located, bringing the total dead to 17. Parson also thanked all of the responders who have come together to help in the investigation. “There are multiple agencies that have come together to try to help with this tragic event,” he said. As of this morning, members of the Coast Guard had arrived to help conduct the investigation into the cause of the vessel sinking. Rader says that the National Transportation Safety Board is expected to arrive on Friday to conduct the formal investigation. While formal cause is being determined, the strong storms moving through the area at the time are thought to be the primary cause. According to the National Weather Service, winds as strong as 65 miles per hour were blowing at the time. It is important to note that the Herschend family does not own Ride The Ducks Branson. Sheriff Rader said that there were many members of the public who assisted in the rescue efforts while first responders arrived. Sheriff Rader thanked the owners of the Branson Belle, Herschend Family Entertainment, for all of their help and support. They also pledged to assist the investigation in every way they can. Governor Parson ordered flags to be flown at half-staff until sunset on Friday, July 27, in honor of the victims. Missouri Senators Roy Blunt and Claire McCaskill both tweeted their condolences this morning. Sheriff Rader said that because this was an ongoing investigation and that families were still being notified, no details about the victims could be released at this time. The NTSB will conduct its formal investigation into the cause of the event and will issue that report at a later date. If you or anyone you know have video of the event, the NTSB and Stone County Sheriff would like to see it. The NTSB can be reached via email at witness@ntsb.gov. Sheriff Rader asked that videos be shared to the Sheriff’s Office Facebook. Keep following The Crane Chronicle for in-depth coverage of this developing story. 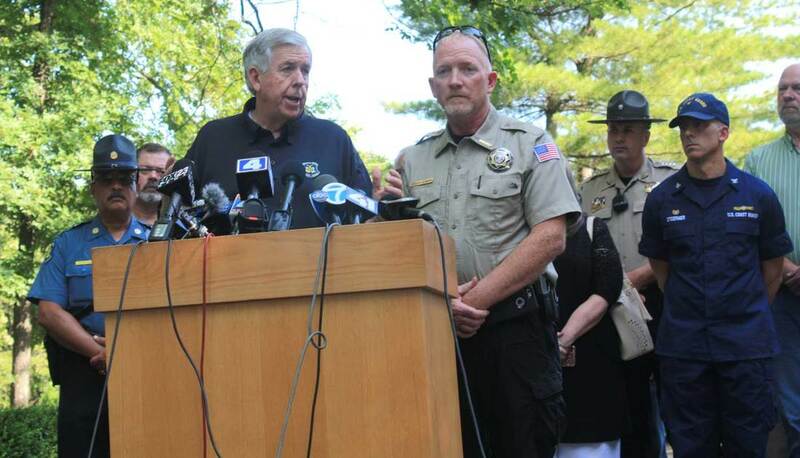 Missouri Governor Mike Parson, left, stands with Stone County Sheriff Doug Rader, right, and addresses members of the press at the Showboat Branson Belle on Friday, July 20.